A basic understanding of Swift and Node.js is needed to follow this tutorial. When building mobile chat applications, it is not uncommon to see developers adding a delivery status feature that lets you know when the message you sent has been delivered to the recipient. Instant Messaging applications like WhatsApp, Messenger, BBM, Skype and the like all provide this feature. Xcode- The application will be built using Apple’s Swift programming language. NodeJS (Express) - The backend application will be written in NodeJS. Pusher - Pusher will provide realtime reporting when the sent messages are delivered. You will need a Pusher application ID, key and secret. Create your free account at pusher.com, then grab your app ID, key and secret from the Pusher dashboard. Below is a screen recording of what we’ll be building. As you can see, when a message is sent, it is marked as sent, and the moment it hits the recipient’s phone, it is marked as delivered. 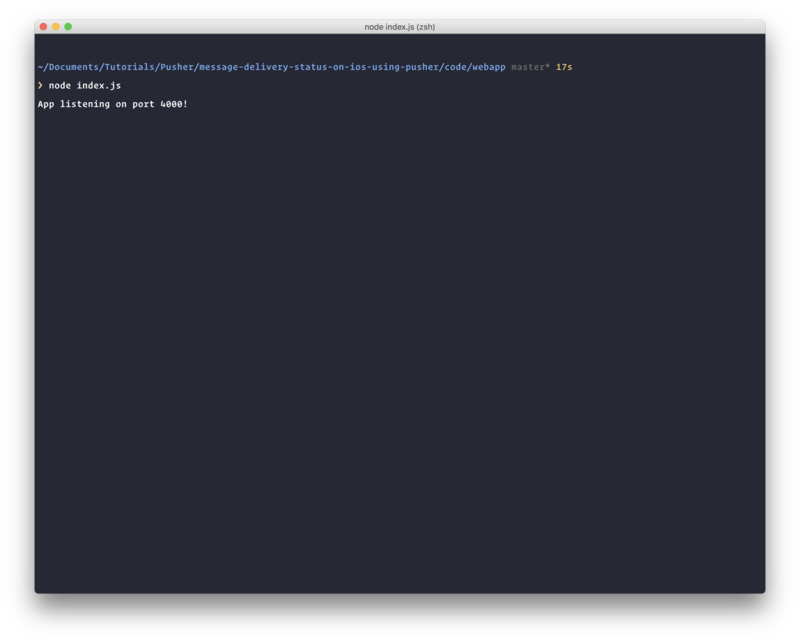 Now run the command pod install so the Cocoapods package manager can pull in the necessary dependencies. When this is complete, close Xcode (if open) and then open the .xcworkspace file that is in the root of your project folder. 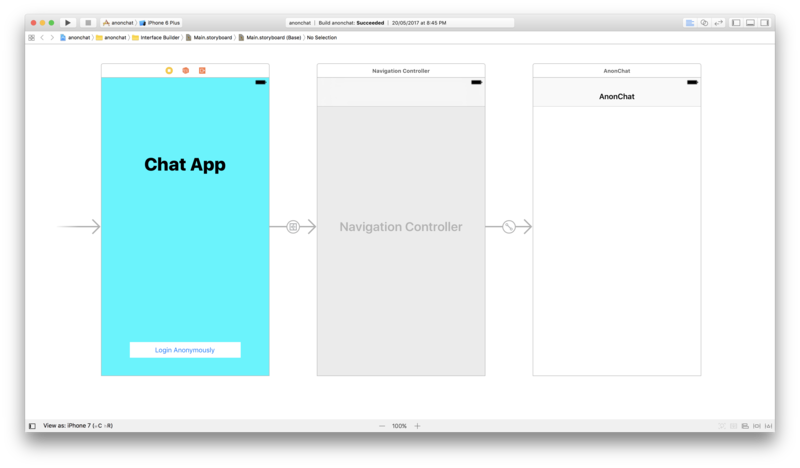 What we have done above is create the first ViewController which will serve as our welcome ViewController, and we have added a button which triggers navigation to the next controller which is a Navigation Controller. This Navigation Controller in turn has a View Controller set as the root controller. Next, we create another controller called the ChatViewController, which will be the main power house and where everything will be happening. The controller will extend the JSQMessagesViewController so that we automatically get a nice chat interface to work with out of the box, then we have to work on customizing this chat interface to work for us. If you notice on the viewDidLoad method, we are generating a random username and setting that to be the senderId and senderDisplayName on the controller. 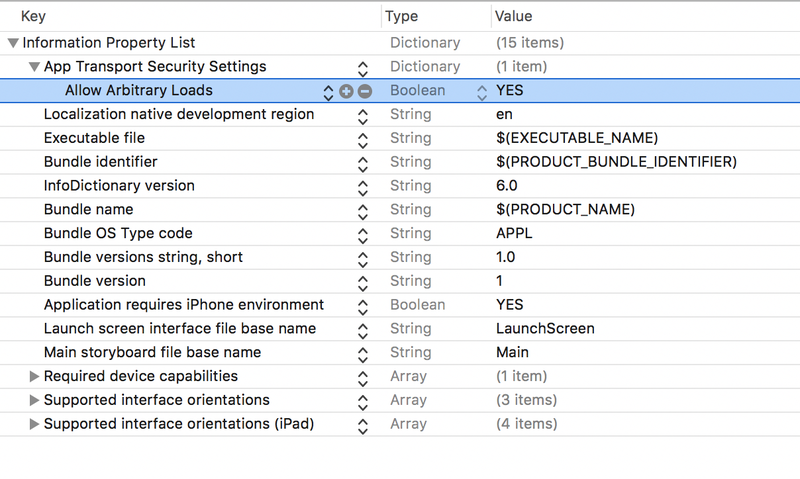 This extends the properties set in the parent controller and is required. Before we continue working on the chat controller, we want to create a last class called the AnonMessage class. This will extend the JSQMessage class and we will be using this to extend the default functionality of the class. In the class above we have extended the JSQMessage class and we have also added some new properties to track: the id and the status. We also added an initialisation method so we can specify the new properties before instantiating the JSQMessage class properly. We also added an enum that contains all the statuses the message could possibly have. In the above code, we started customizing the way our chat interface will look, using the parent class that has these properties already set. For instance, we are setting the incomingBubble to blue, and the outgoingBubble to green. We have also eliminated the avatar display because we do not need it right now. Great. Now every time we send a new message, the didPressSend method will be triggered and all the other ones will fall into place nicely! let message = self.addMessage(senderId: author, name: author, text: text, id: messageId) as! AnonMessage? In this method, we have created a Pusher instance, we have set the cluster and the key. We attach the instance to a chatroom channel and then bind to the new_message event on the channel. We also bind a message_delivered event, this will be the event that is triggered when a message is marked as delivered. It will update the message status to delivered so the sender knows the message has indeed been delivered. 💡 Remember to replace the key and cluster with the actual values you have gotten from your Pusher dashboard. Now we should be done with the application and as it stands, it should work but no messages can be sent just yet as we need a backend application for it to work properly. Now that we are done with the iOS and Xcode parts, we can create the NodeJS backend for the application. We are going to use Express so that we can quickly whip something up. Here we define the entire logic of our backend application. We are also using SQLite to store the chat messages; this is useful to help identify messages. Of course, you can always change the way the application works to suite your needs. The index.js file also has two routes where it receives messages from the iOS application and triggers the Pusher event which is picked up by the application. Substitute with the actual values from your Pusher application. Now run npm install on the directory and then node index.js once the npm installation is complete. You should see an App listening on port 4000! message. With this change, you can build and run your application and it will talk directly with your local web application. In this article, we have explored how to create an iOS chat application with a message delivery status message after the message is sent to other users. For practice, you can expand the statuses to support more instances. © 2019 Pusher Ltd. All rights reserved. Pusher Limited is a company registered in England and Wales (No. 07489873) whose registered office is at 160 Old Street, London, EC1V 9BW.